Or a tea. Or an afternoon cocktail party. I would be properly attired! The skirt, believe it or not, used to be a pair of pajama pants. It's 100% silk fabric & I couldn't possibly say no! I cut the legs off right below the crotch & opened up the inseam so I had two large chunks of fabric. Then, I stitched the two together, making the hem of the pants the top of the skirt. After that, all I had to do was pinch + pin a bit to adjust the fit, insert an invisible zipper, and hem the bottom! So simple. I'm really excited about the shirt, & am thinking that a version of it will be in my spring/summer collection. It was just a basic scoop neck top, but with a longer cut & an unfinished bottom (so as to avoid awkward lines under the skirt). Then I cut spirals out of the fabric, and handstitched them with pearls to the neckline. I was inspired by... okay, this is going to sound funny, but you know how in regency times, men would wear those huge, ruffled, complex cravats? And the fabric is just spilling out over their vests & coats. I love the way that behaves! So I tried to modernize it, & it ended up being a very pleasing effect. So, yes, I'm very excited about this new outfit! I made both pieces yesterday evening--that's how easy it was! It doesn't exactly fit in my world right now, but I'm wearing it anyway. 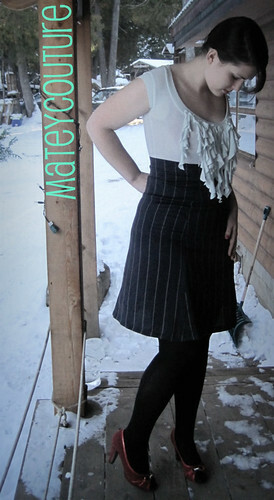 I love that skirt Addie, and it looks amazing on you sweety! You look great and the shirt totally reminded me of the mens Victorian cravats! Not crazy at all! I indeed LOVE ruffles too:) they make me happy! great work ! ! ! 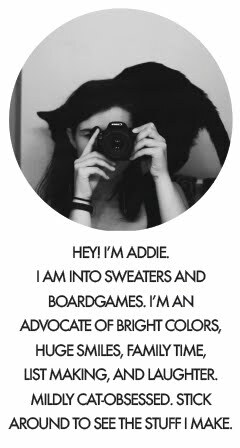 Gorgeous, Addie! I LOVE IT! You seriously inspire me EVERY time you post. Love the outfit! I can't believe you made the skirt from pj pants, so inventive! I also love Victorian cravets...I costumed Cinderella last Spring and we used a ton of them and I really wanted to find a way to wear them myself without looking too silly and you have figured it out. I also love the skirt in the post below this. I've been wanting to make a skirt like that, but didn't know where to start. Tany - Why thank you, dear! Ooh, what did you make out of pajamas? &, indeed, ruffles are never to be underestimated! Hannah - Aw, thank you, Hannah! That really means a lot to me! Whitney - Thank you! Oh, that's right, you've done quite a bit of costuming! So you definitely get how fun it can be to take bits of costume & apply them to everyday wear. That's my favorite! I think some people could probably pull of something much closer to a cravat, don't you? I'm too intimidated to pull it off, personally! & thanks, on the skirt, too! I hope my tutorial will be a bit of use--but you could definitely make one without trouble, I'm sure! It was a top with long sleeves and baggy pants, but I hate how silk rips at the seams so easily. So, I wore it once & hated it. It sat in my drawer for 2 months! A halter top that had a sweetheart line and cut semi triangles for the bottom skirt and inserted it right under the bust. So it had a lovely comfortable empire waist! Gosh, I wish I had a pic of it.